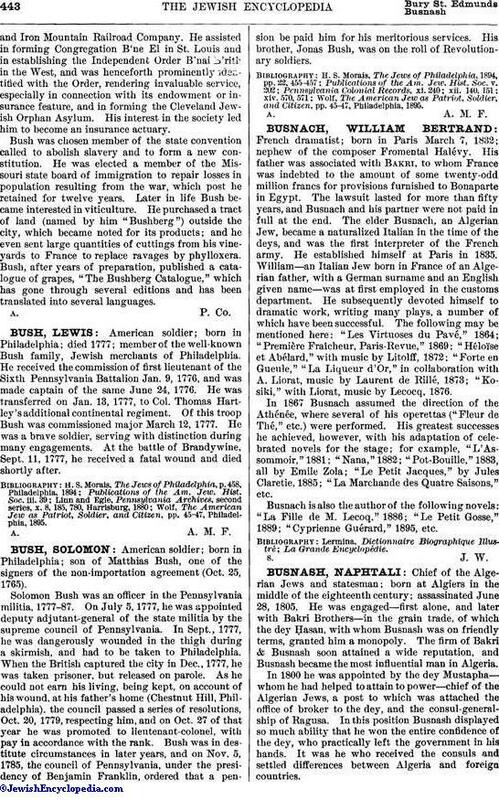 American soldier; born in Philadelphia; died 1777; member of the well-known Bush family, Jewish merchants of Philadelphia. He received the commission of first lieutenant of the Sixth Pennsylvania Battalion Jan. 9, 1776, and was made captain of the same June 24, 1776. He was transferred on Jan. 13, 1777, to Col. Thomas Hartley's additional continental regiment. Of this troop Bush was commissioned major March 12, 1777. He was a brave soldier, serving with distinction during many engagements. At the battle of Brandywine, Sept. 11, 1777, he received a fatal wound and died shortly after. Wolf, The American Jew as Patriot, Soldier, and Citizen, pp. 45-47, Philadelphia, 1895.